Believing peacemaking to be an inherent part of discipleship, Presbyterians have taken many valiant stands for peace throughout our history. However, changing global realities, political and military actions, and new weapons of war have made the world less safe than ever. The church must reconsider how to be faithful peacemakers in this changing reality. 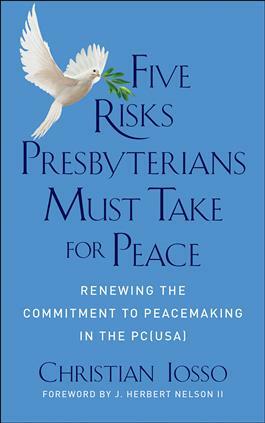 The Presbyterian Church recently spent six years reflecting on peacemaking. Building on past policy documents, people at all levels of the church studied and discussed what peacemaking policies needed to be modified given the world context today. The 2016 PC(USA) General Assembly affirmed five affirmations the church must make to fulfill its peacemaking calling. Those affirmations become risks when truly taken, because their message collides with the demands for continued sacrifice by the powers that be. In this timely resource, author Christian Iosso explains what the five risks are, how they differ from previous positions, and what taking each risk might look like today. Ideal for individual or group study, this important resource includes questions for reflection and discussion.